I mentioned recently that I've gone through at least two distinct phases in recent memory, when it comes to my taste in jewelry. For quite some time, I was very much a statement necklace kind of gal. And not just any statement necklaces, but those 2011-ish colorful crystal collar or bubble necklaces that are no longer popular, and generally aren't sold anywhere these days, except for Kate Spade and J.Crew sometimes. I regularly wore them to work as recently as summer 2014 while interning, and thought they were a great way to add color to my otherwise sedate business casual outfits. But by spring 2015, even though I had just purchased a very statement-y J.Crew necklace secondhand, I'd stopped wearing those necklaces much. By the time I started working full time that fall, I'd stopped completely. I'm not sure what caused the sudden change in my jewelry tastes, because I still like the statement necklaces I have, and am totally still holding on to a substantial collection, hoping there will come a time when I could wear them again, without feeling like they're hopelessly dated. I suppose I realized, somewhat abruptly, and probably later than most, that they'd become obviously dated very quickly. I must have realized that I never saw anyone wearing those statement necklaces out and about anymore, even in NYC, with all the wide range of styles one sees people wearing, so maybe that's what accounted for the change. 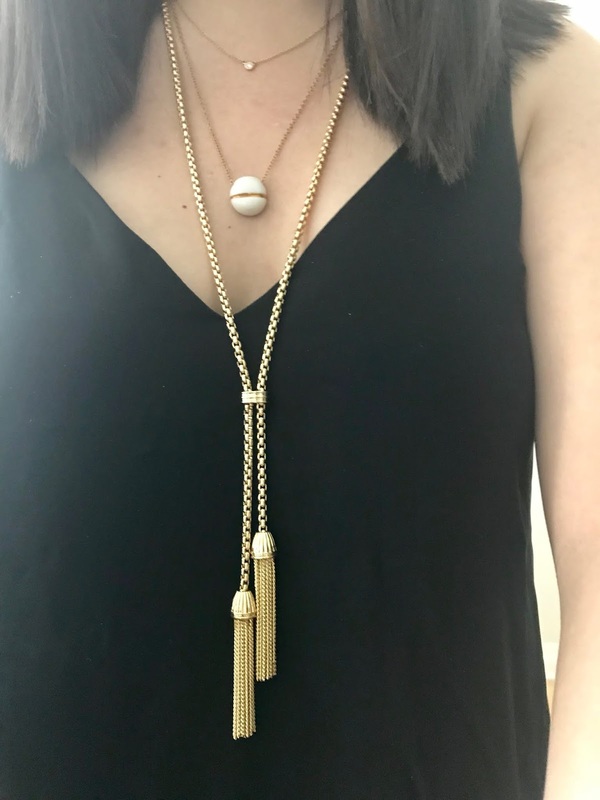 After my "statement necklace phase" I stuck to dainty jewelry for a long time, most days just the pearl studs I wear daily (from Amazon) and my graduation necklace. I was occasionally inspired by something more interesting (K was kind enough to get me that Alexis Bittar bracelet for Christmas), but was generally not buying or wearing new jewelry much. Anything new I was inspired to look into (including that dainty opal ring I keep mentioning), I'd mull over for a long time, and often never actually bought, except for my Porcelain and Stone Buoy Necklace (my sister W bought me the Porcelain and Stone Navigation earrings as a combined birthday and Christmas gift). More recently, I seem to be getting into more assertive jewelry again, mainly with that J.Crew Tassel Chain Necklace. I've also gotten into layering my necklaces a bit more, which wasn't really a thing I could do with those statement necklaces of yesteryear, when my collection was solely pieces of approximately the same length, that would definitely not go together. This post is mostly intended as a way to talk about two very different women artist-led jewelry brands I'm currently loving, and looking to shop from, both of which I've mentioned before. In large part because I expect my proportions and clothing size to change fairly dramatically in the foreseeable, though not immediate, future, it's not a good time to shop for clothes. I seem to have replaced my usual interest in clothing with a suddenly powerful interest in acquiring more jewelry to build my collection. Porcelain and Stone, designed by Kimberly Huestis in the Boston area, is a longtime favorite. 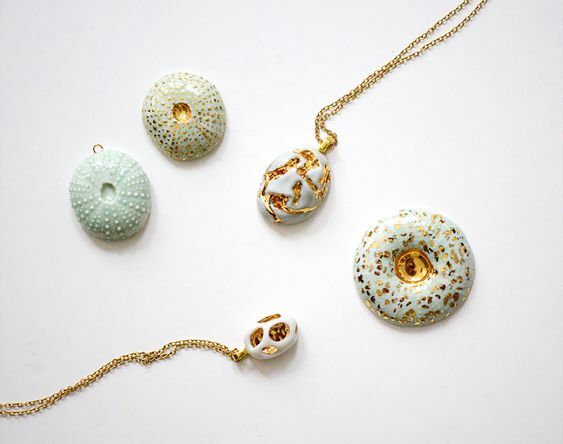 Her jewelry, which is mostly made of porcelain and often glazed to look like marble or natural stone with gold accents, often has a classic, nautical, and somewhat preppy vibe. She does a good mix of larger, more statement-making pieces (like the large Uni sea urchin pendant in progress on the right of the photo) and smaller, more subtle pieces like my buoy necklace (which comes in a few other color combinations and shapes). She sells a bigger collection on her website, and is also starting to work with turquoise. She also regularly posts an even wider collection of her work on Instagram, and seems to sell at a lot of craft fairs and small shops nationwide. I've been thinking of adding another piece or two of her work to my growing collection of her pieces, probably starting with the small Uni necklace that's in progress in the upper left corner of the photo. Spoiler alert for this month's shopping post, I ended up buying an Alighieri necklace after constantly browsing the brand's items online for a few weeks. I'm completely in love with it, enough that I'm still browsing constantly for a possible second purchase, even though it's quite extravagant of me! Some of my favorite pieces that are available from the online retailers that ship to the US are pictured in the widget below, though I'm much more likely to pick something that's only available on Alighieri's website at the moment. My favorite of these is the ancient amulet-looking Deceptive North Star necklace (it's cheaper to buy direct than from Luisaviaroma), the antique gold coin-looking Other Side of the World necklace, or the Surreal gold hoops that are a Net-a-Porter exclusive. In actual practice, most of her earrings are probably too heavy and large for me (I'm not used to large, dangly earrings and my earlobes get irritated easily) but her earring designs are also gorgeous. 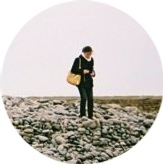 The brand encourages layering, as seen from the above photos. From browsing their selection online, the length of most of her necklaces is ~16 to 19 inches. The Alighieri necklace I bought (~18 to 19 inches) hangs at around the same height as other necklaces I own (which are adjustable in the range of ~16 to 20 inches), which means that all the pendants hang right in the same narrow zone between my collarbones and the top of my chest, and tend to cover each other up, rather than look good together. I suspect that they customize the necklace lengths for photoshoots sometimes, and even then, it often looks like the pendants are hanging closely together that they might bump into each other frequently during the day, possibly get tangled, and not be entirely practical to wear together. Either way, most of my collection (the buoy necklace and the Mejuri zodiac necklace) is too different in style to look harmonious with my new Alighieri necklace. So I guess layering jewelry properly, particularly necklaces, is a bit difficult for me so far, with the items I have. What style of jewelry do you favor? Do you have any favorite jewelry brands or designers? 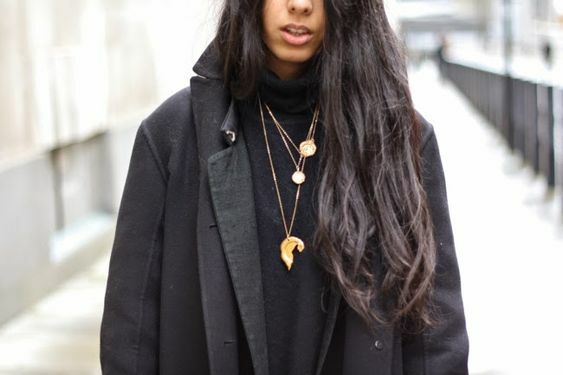 Do you have any favorite combinations of necklaces or other jewelry to layer together?